Poe Dameron is one of the new Star Wars characters that has really endured after we first met him wise cracking and hot shotting around in his X Wing during The Force Awakens. 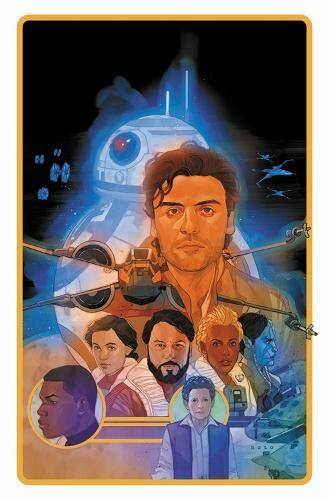 Such a hit with Star Wars fans was Oscar Isaac’s Poe that he was granted his own comic book which concludes with this fifth instalment. In all honesty, it’s the right time to bring it to a close as events in the book catch up with the climax of The Last Jedi. Without knowing what’s going to happen in Episode IX, I imagine it’s not really possible to carry on and so after thirty plus issues this entertaining series comes to a close. The early issues served as a prelude to The Last Jedi, following Poe and his Black Squadron heroes through many a caper involving the requisite Star Wars action and adventure with heaps of daring and derring do. Lor San Tekka was out there and the Resistance pilot needed to find him, once found we know what happened and the narrative arc switched in these later issues to the aftermath of the catastrophic Last Jedi last stand. The Battle of Crait has left Leia, Poe, Finn, Rey, Chewie and the Droids on the run aboard the Falcon reflecting on the events that have seen their ranks decimated and filling us in on, amongst other things, where exactly Poe ended up after his Tie Fighter crashed on Jakku, the Battle of Starkiller Base and one of the reasons why support never arrived on Crait in the Resistance’s most desperate hour. I followed this series right from the very start and found it to be a most entertaining caper in the same way that The Force Awakens reignited the franchise by creating something that felt like the Star Wars of old and not the hyper stylised prequel trilogy. There was something about the wild ride Poe has taken us on that tapped in to that timeless little guys taking on the big guys mythos in this comic book that gripped me in Mr Lucas’ galaxy far, far away all those years ago. There’s plenty of daring rescues and last gasp saves to accompany the devious “Boo Hiss” scenery chewing First Order villains, the odd bit of romance thrown in and the regal presence of Princess Leia who’s elder stateswoman brings to mind a battle hardened version of Mon Mothma. There’s plenty to enjoy especially the crisp and beautifully realistic art work that brings a wondrous multitude of alien worlds and species to life as well as the usual heroes and villains. There’s even a cameo from Return of the Jedi favourite Nien Numb. The final instalments in this great series are an exciting set of one off escapades that fit together to give a bigger picture of what Poe, Black Squadron and the Resistance were up to around the end of, and post, The Last Jedi. So that is that for now. Maybe we’ll see the series picked up again once Episode IX has given us more strands to feed off? Whatever, Poe Dameron has set up nicely for whatever does come next, though you’ll have to wait until the cinema’s fling their doors open at Christmas for the concluding chapter of the latest trilogy to find out exactly what that will be. I’ll bid a sad farewell to this title but hope to see it again one day. Great stuff. Marv Gadgie.